It's fun to imagine an economy where machines are smarter than humans. But we don't need an artificial crisis over artificial intelligence. It's become very fashionable very quickly to talk about robots and their insatiable appetite for your job. 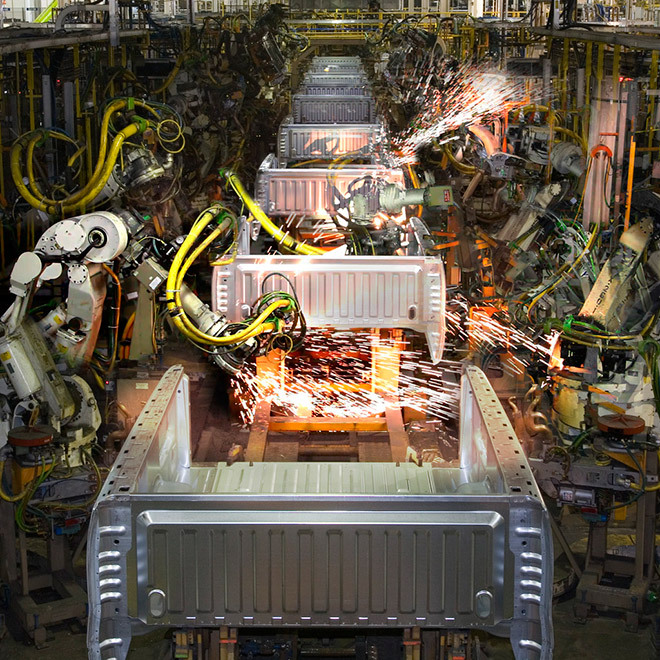 Industrial machines can and do replace human beings in car factories, electronics plans, and food manufacturing centers. But the editorial rage against the machines is messy, and the automatons might not have as much to do with our current jobs crisis as the volume of robot reportage might suggest. Let's say it upfront: Technology can replace jobs and (at least temporarily) increase income inequality. From the spinning jenny to those massive mechanical arms flying wildly around car assembly lines, technology raises productivity by helping workers accomplish more in less time (i.e. : put a power drill in a human hand) and by replacing workers altogether (i.e. : build a power-drilling bot). Some worry that AI is getting so smart that we're making workers replaceable at an accelerating rate -- not just with car assembly bots, but also with big data and software that do white-collar work. Technology of the robot and non-robot variety has been replacing people for decades. ATM machines and airport kiosks tellers and simple office software does the work of thousands of tellers, and attendants, and office assistants better than humans ever could. But we had many of these technologies in the 1990s when unemployment was about 4 percent. So what's changed? The robot fascination is leading some to think we are living through a particularly disruptive Age of Robots right now, and that it might even be contributing to the slow recovery. Maybe, but the case is far from clear. In the Financial Times, the super-sharp Edward Luce advances some frightening thinking about the future of robots shoving workers out their office chairs under the admonishing headline (which he might not have written, himself) "Obama must face the rise of the robots." Must he, though? Where is the evidence that the Obama recovery has been slowed by a recent acceleration of industrial bots, as Luce suggests? In fact, Obama's so-called jobless recovery has been significantly more "jobful" than the recovery we had in 2001 when you compare the pace of private sector jobs created. The labor recovery has been only slightly worse than our pace following the early '90s slowdown. You might respond that all of these recoveries have been stamped out by accelerating technology. And that might be true. But if it is true, you would expect two things to be true, as well. First, you would expect GDP to grow considerably faster than jobs, as technology added to productivity without adding to payrolls. Second, it should be easy to make the case the technology is replacing workers on a massive scale because the most technologically advanced sectors should be performing the worst. Real GDP growth in 2011 and 2012 barely kissed 2 percent, which is almost fine for a healthy economy and really not at all fine for a recovery. In that time, we added a similarly fine but not especially remarkable 180,000 jobs per month. This doesn't look to me like an AI nightmare. It looks more like an old-fashioned demand-starved economy. When you tab over to the sector-by-sector breakdown of jobs lost and gained between 2008 and 2012, you find construction and manufacturing scraping the bottom. Let's draw a bright white line between these two. Construction, which is clearly the economy's worst-performance industry, hasn't had much productivity growth, according to the analysis from the McKinsey Global Institute, and its miserable performance reflects a simple truth that has nothing to do with robots. Nobody's buying houses. Manufacturing employment in the United States has been eaten alive by those twin forces of globalization and technological innovation. The ascendance of developing economies in Asia and the mastery of mechanized manufacturing let the U.S. make much more with less. That's precisely the productivity revolution the robot crowd fears will sweep over the entire economy. But has there really been a mass adoption of industrial robots recently? As a share of the population, we're about as "automated" as Spain, considerably behind Germany, and less than half as automated as South Korea and Japan, according to the International Federation of Robotics. And yet, there's little suggestion that Spain's unemployment crisis is fundamentally a robot crisis, and the countries severely more automated than us all have lower unemployment rates. What ails us today isn't a surplus of robots, but a deficit of demand. Yes, we have a manufacturing industry undergoing a sensational, but job-killing, productivity revolution -- very much like the one that took farm employment from 40 percent in 1900 to less than 5 percent today. But the other nine-tenths of the economy are basically going through an old-fashioned weak-but-steady recovery, the kind that hundreds of years of financial crises would predict. Just because robots aren't the most important force in our current economic malaise doesn't mean we shouldn't talk or worry about robots. Indeed, The Atlantic has talked and worried about them, a lot. "The threat of technological unemployment is real," Erik Brynjolfsson and Andrew McAfee wrote in their great book Race Against the Machine, excerpted at The Atlantic here, here and here. Economist Noah Smith designed a safety net for workers in an automated world here. As robots move off the factory floor in the next 20 years, the effect on well-being and income will be complicated and impossible to predict. On the one hand, we should root for more automation. More robotics in the hospital, for example, could make surgeries cheaper and safer. But the mass-market depends on our workers also being our consumers. What does it mean when more work is done by machines that don't consume anything? Where does the money go, if not to the lucky owners of the robots themselves? If tomorrow's robots are smarter than people -- not just high-school graduates, but also college graduates -- what happens to the incentive to invest in education? Should we respond by giving each new born a check? ... a stock portfolio!? ... a robot of her own?! These are fun and scary ideas, and they're fun and scary to think about. But let's calm our warm-blooded nerves by remembering that the current stock of humanoid robots is still remarkably primitive, as Brynjolfsson and McAfee acknowledge themselves. They look creepy. They struggle with people skills. They fall down stairs. They're bad at problem-solving. They're not very creative. This is where you say "40 years ago, AI couldn't do the work of retail managers and lawyers, and look now." That's right. And 40 years from now, grappling with the fallout of an automated economy might be the most important economic issue of our time Today, however, worrying about robots taking over the economy feels more like an intellectual exercise. There's no need for an artificial crisis over artificial intelligence.